Career academies are small, personalized learning communities within a high school that equip students with job skills and ready them for success in the workforce. Students enter the academy through a voluntary process; they must apply and be accepted with parental knowledge and support. A career academy involves teachers from different subjects working together as a team. Staff members, who often share common planning time, work together to implement the key features of the academy and provide students with training in the respective career field. Students may be grouped together for several periods every day with a core group of teachers. This promotes a family-like atmosphere and results in close student-teacher ties. A small learning community supported by a local advisory committee. A career theme that may include a college-prep curriculum and lead to industry certification. Partnerships with employers, the community, and higher education institutions. By design, these three central elements create a career academy that is rigorous and relevant. Increase student achievement and graduation rates through integrated academic and career curricula. Focus on career preparation through rigorous curriculum and industry certification. Raise student aspiration and commitment to academic achievement and work ethics. Promote leadership development through participation in career student organizations. Support graduation requirements by providing creative, applied majors. Promote dual enrollment, articulated credit, or occupational completion points so that students may earn post-secondary credit while in high school. Support the state’s economy by meeting industry needs for skilled employees in high-demand occupations. 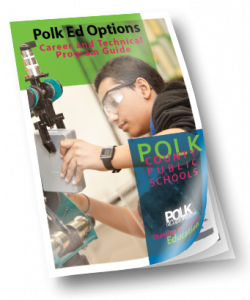 For more information, admission requirements, a current list of Polk Career Academies or to apply online, please visit the official career academy website at www.PolkAcademies.com. A Career Academy combines an academic curriculum with an occupational theme through the career and technical courses, and provides a student with a program of study. Partnerships with community members and local businesses help strengthen the real world experience of a Career Academy. Students enrolled in a Career Academy may have more opportunity for college credit, on the job training and to earn certifications appropriate to the career field. If I am an In-Zone student, should I apply to a Career Academy? No. Please speak with the Guidance Office at your students school to inform them of your student’s desire to be in an academy at your zoned school. Should In-Zone students apply online for Polk Academies? No. Only students who are desiring to attend an out-of-zone school should apply. How are academies and school-based enterprises related? A School-Based Enterprise is a business within the Career and Technical Education program. For example, the Stable Café is run by the Culinary Program at Lake Region High School. A career academy can also have a school-based enterprise, such as the marketing business run by students in the iMag Academy at Lake Region High School. Can academy students participate in other school activities such as clubs and sports? Yes! Any student enrolled in a Career Academy has the opportunity to be involved in as many school activities as they choose. Being a vital part of the school community is as important as being a vital part of the academy. Industry certification is a certification that is recognized within the industry of the career and technical program. Earning an Industry Certification can provide students with employment opportunities upon graduation that may not be available to other students. An example of an industry certification is the Adobe Certified Associate (Flash, Photoshop, Illustrator, etc.) which is certified by Adobe Systems. How do college and career majors relate to career academies? The state of Florida requires students to identify their Major Area of Interest upon enrolling in the 9th grade. A student who enrolls in an academy will identify the academy’s career field as their career major. Why should I join an academy? The most important reason to join is students will be part of a group who will share their interests and desire to learn about a specific career field. Students will be taught by teachers with expertise in the career field and excitement to engage learning. Joining a Career Academy can also provide opportunities that may not be available to other high schools students. Students may earn more college credit through their enrollment as well as become more involved in local businesses. No. If you are already part of a Career Academy you do not need to apply again. Yes. Some academies may have prerequisites before applying to the program. Students will need to check the academy they are interested to determine if they meet the requirement. Does Polk Academies provide transportation? No. Academy students are responsible for providing their own transportation. What are Career and Technical Student Organizations (CTSO's) and how do they relate to academies? Career and Technical Student Organizations are a nationally recognized organization that focuses on the career and technical program a student is enrolled in. They provide leadership and competitive opportunities based around the CTSO career theme. CTSO’s provides further opportunity to engage students in their career field of interest. A CTSO can be offered both within a Career Academy as well as within a Career and Technical Education program. Most career academy students will have the ability to earn the Florida Gold Seal Vocational Scholars Award which is part of the Florida Bright Futures Scholarship Program. For more information about how to qualify, students should see their guidance counselor. Articulation is earning college credit because of enrollment in a high school program. For example a student in an Early Childhood Education program can earn 6 hours of college credit at PCC for completing the program at his/her high school. Some articulation agreements require students to pass a specified test or provide a portfolio of work.